The Eighth Avenue Bar and Resto store front. Type : Bar and Resto , Western Restaurant, serving Premium wine and beer, western dishes, in a vintage environment. Opening Hours : Monday to Friday 12PM to 1AM, Saturday 4AM to 1AM, Sunday 4AM to 12AM. The Eighth Avenue Bar Counter. 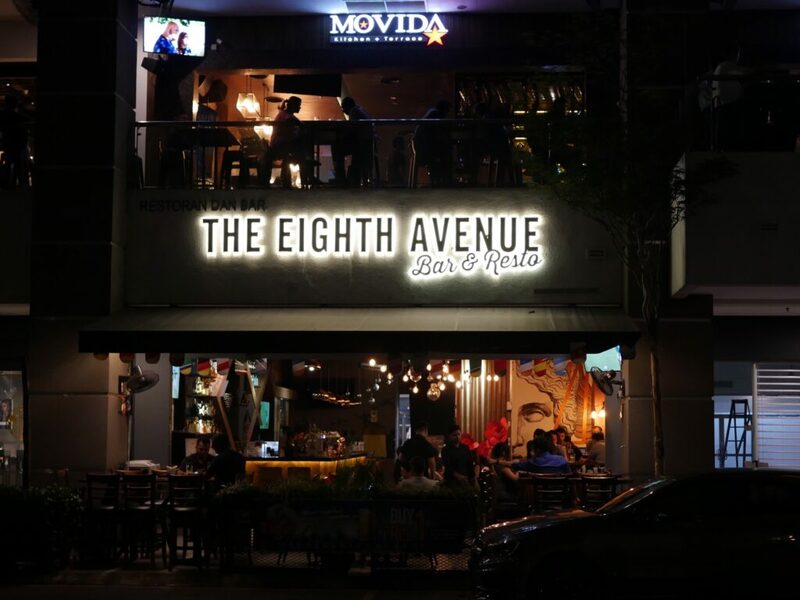 The Eighth Avenue Bar and Resto is located in a prime area beside Publika Mall at Jalan Dutamas of Kuala Lumpur. Publika is famous for variety of restaurants and bars around the Mall with food and beverages ranging from east to west and fusion. Food lovers will hang out here for pristine dinning. The Eighth Avenue stands out on its own as a bar with vintage environment and warm yellow lightings. They serve beer and wine of all kinds, variety of western dishes with generous proportions and not to forget their famous pork dishes, especially their signature honey pork ribs. The mural on the wall. We try out some of their offerings and delight with their pork rib dish. We love their nachos too. Serving time is adequately fast and efficient, depending on order volumes and peak hours. The waiters are helpful. The dishes are well prepared and decorated. Overall it is a recommended bar and restaurant if you have the chance to stop by Publika. Do bring your family and friends here and enjoy the warm environment here. Kids playground is just across the road. They have swings and slides, but for safety reasons, they only allow child below 10 years old to use the facilities. Finding parking can be tough sometimes during peak hours. The place is lifely till late midnight. Valet parking is available with a charge.